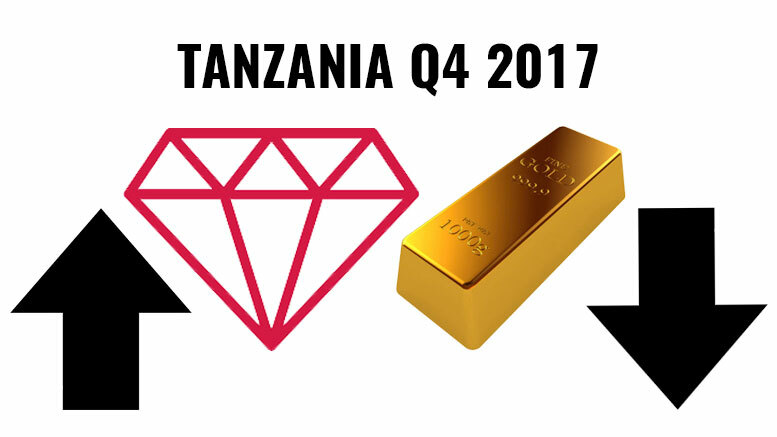 The Bank of Tanzania (BOT) recently published its Economic Bulletin for Q4 2017 showing a growth in diamond production and in tourist arrivals and a decline in gold production. The production of diamonds more than doubled in Q4 2017 to 79,902.7 carats from 31,899.7 carats in Q4 2016, largely on account of increase in volume. The value of the diamond production reached USD 18.5 million compared to USD 8.2 million. The value of gold and diamond produced by largescale mining companies declined to USD 399.4 million in the quarter ending December 2017 from USD 445.8 million in the corresponding quarter in 2016. The production of gold declined to 11,243.4 kilograms from 12,025.5 kilograms following the suspension of mining operations by Bulyanhulu Mining Company in the quarter ending December 2017. Tourism Tourist arrivals increased to 130,587 in the Q4 2017 from 119,589 in the corresponding quarter in 2016 on account of the ongoing improvement of services and infrastructure, coupled with marketing initiatives adopted by the Government for both traditional and non-traditional markets. As in the previous quarters, visitors from Europe—mostly German and the United Kingdom—continued to dominate the market, accounting for 49.4% of the arrivals. Completion of some ongoing projects, including Karume International Airport Terminal II, coupled with continued investment and innovative services by the private sector are expected to increase the number of visitors and contribution of tourism activities to the economy.